Check out what to expect from Amana heat pumps – economy and top of the line models, the warranty, efficiency and quality features, and see how they contribute in great savings, environment protection, reliable and comfortable operation. Amana heat pumps are legends in the industry. 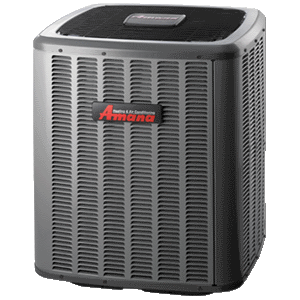 Amana has been making top quality appliances for nearly 80 years, and their HVAC products such as the air-to-air heat pumps are no exception. They deliver some of the most reliable heat pumps on the market for year in and year out heating and cooling. With the high levels of craftsmanship, Amana heat pumps are able to provide a lifetime replacement warranty. But that’s not all - all models come with an automatic 10 year parts warranty as well, so no matter what heat pump model you get, you know Amana stands behind their work. Models with the lifetime warranty include: Amana AVZC20, ASZC18, ASZC16 and ASZ16. Models with the 10 year parts warranty only include: ASZ16 and ASZ14. All of Amana’s heat pumps use the environmentally friendly R-410A coolant instead of Freon so they are kinder to the planet. The ComfortNet is the heart and mind of Amana heat pumps. It’s an intelligent thermostat easily programmed so you can choose an ideal comfort level day or night. The system is designed to enhance the already high energy efficiency of the heat pump, and with its simple-to-set programs and timer, you can make sure your home is always warm when you get home without having to have the heat on all day. Also designed to help produce uniform comfort throughout your home, the ComfortNet is more than just a thermostat. It also features advanced diagnostic tools and maintenance alerts with an easy to read LCD screen. You never have to wonder if your heat pump is working as it should or if it needs any maintenance, your Amana heat pump will tell you. Models that come with the ComfortNet include: AVZC20, ASZC18 and ASZC16. Other models do not come with ComfortNet but do include the diagnostic maintenance alert tool such as the ASZ16 and ASZ14. The main issue many people used to have with heat pumps was that they were noisy. With Amana’s advanced noise reduction technology you can enjoy the comforts of your own home in peace. All Amana heat pumps feature an advanced noise reduction technology such as the quiet condenser fan motor. Some models have even taken noise reduction a step higher with an acoustically designed sound reduction blanket. Made of a high density material, the sound blanket is designed to reduce the noise but not the performance of the Amana heat pump. Some models also boast one more level of sound reduction with the sound control top to give a triple level of sound reduction making Amana heat pumps some of the quietest on the market. Models featuring the sound control top: AVZC20, ASZC18 and ASZC16. Models featuring the sound blanket technology: AVZC20, ASZC18, ASZC16, ASZ16 and ASZ16. Models with the quiet condenser fan only: ASZ14. If you want quiet and efficient performance, Amana residential heat pump AVZC20 fits the bill. At the top of the line, this heat pump can deliver as much as 21 SEER cooling and up to 10 HSPF heating effectiveness. The variable speed compressor is what gives you top performance because it can step up and down as needed to keep your house perfectly comfortable. Other single stage models can only deliver constant running which draws more electricity. Copper tubes and an aluminum fin condenser coil give you the maximum heat transfer possible. At a slightly less 18 SEER and 9.5 HSPF cooling and heating efficiency, this model still has a two stage UltraTech scroll compressor for improved efficiency and reduced energy draw over single stage models. The SmartShift defroster keeps your heat pump ready to go on the coldest day, and it does so quietly. A solid, heavy gauge steel case with a louvered cabinet keeps the coils protected and the baked enamel paint job keeps the steel case protected. The ASZC16 model also features the Copeland two stage UltraTech scroll compressor, giving you as much as 16 SEER cooling and 9.7 HSPF heating effectiveness. Louvers on the cabinet keep the coil protected and safe from dirt and debris. Like the higher capacity ASZC18, it has a filter drier on the coolant line to give your heat pump years of worry-free operation. The ASZ16 model is the first to not have the limited lifetime replacement warranty. It still packs plenty of features like a quiet, single speed condenser fan motor and copper tubing with aluminum fins for exceptional heat transfer. It can still give you as much as 16 SEER cooling and 9 HSPF heating so you can stay comfortable in any season. SmartShift defrosting and a heater band plus suction line accumulator give you peace of mind that your heat pump will work on a cold winter’s day while the inline filter drier will protect your coolant for years to come. This model does not have a multi-stage compressor and it only has a single speed condenser fan motor, but it does have the ability to give you up to 15 SEER cooling and a very solid 9 HSPF heating ratio. The ASZ14 also has the high density foam cover for quiet operation as well as a three blade design for a quieter condenser fan. This entry model by Amana gives you a 15 SEER cooling ratio and 8.5 HSPF heating factor, making even this model one of the better ones on the market. It does come with just a single-stage compressor, so it is not as highly efficient as the top models are. Amana’s heat pumps are some of the best money can buy. These features and many more are what set the Amana HVAC brand apart as leaders in the heat pump industry. Whether you are looking for quiet heating in the winter or comforting cooling to escape summer’s heat, Amana heat pumps provide you a reliable product for years to come. And if you choose the Amana heat pump with the high efficiency, such as the AVZC20 or ASZC18, you are guaranteed to see an increase in your comfort while seeing a reduction in your energy bills.